For all the Game of Thrones fans who’ve been rewatching the (lengthy) previous seasons, spending hours deep diving into YouTube theories and conspiracies and got up at 2am to watch the start of the final season, have we got some news for you. Now TV, the only place you can stream Game of Thrones in the UK, have partnered with The Circle to offer 50 mega-fans the chance to get a free tattoo. Running from the 16th to the 17th of April, celebrity tattoo artist Lauren Winzer has flown all the way from Australia to be a guest at The Circle and help the incredibly talented team tattoo the lucky fans. There are 16 specially designed tattoos to choose from, with different fonts available for quotes. Tattoos will be given on a first come, first served basis, so if you’re reading this and keen on having your GOT love displayed on your body for life, head down there ASAP. To celebrate the launch of the new season and #GOTink, Now TV held an amazing launch party at The Circle, where many guests were inked by Lauren Winzer while watching a screening of the new episode. Themed drinks like The Red Woman, made using vodka, tequila, chilli spice, grenadine and pineapple juice were on offer, as well as loads of fun food like Devilled Dragons Eggs and Dothraki Artichoke Hearts. The Night King was wandering around the party too, looking particularly icy and scary due to this blank stare and expressionless face. More than one we looked up from our phones to have him looming over us, and we couldn’t help but nervously giggle every time he moved past us. For more info on the event, you can head to their website here, or to start watching Game of Thrones, you can get a free 7 day trial for Now TV here. 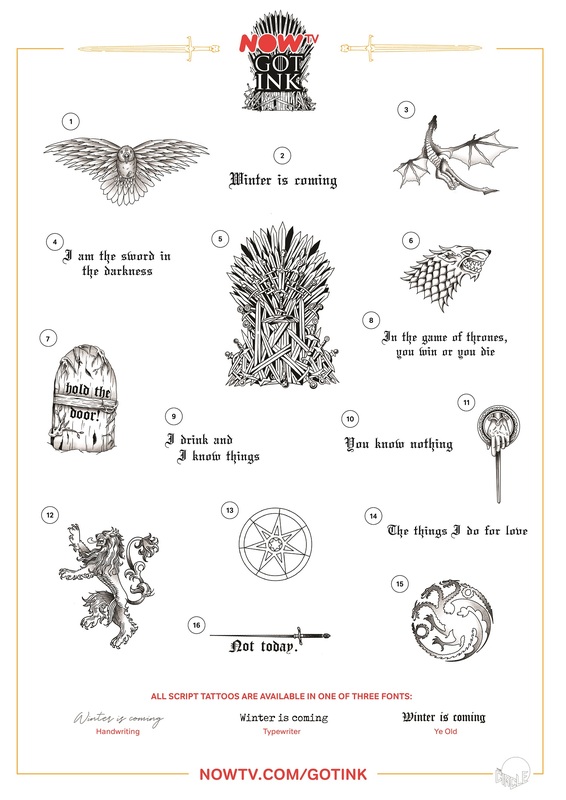 Ever wanted a @gameofthrones themed tattoo? Now’s your chance with @nowtv and @thecirclelondon. 😅 Celebrating the 🎉 FINAL SEASON OF GOT 🎉 Now TV’s Studio Takeover at The Circle Tattoo Shop is running for two days only from this Tuesday 16th to Wednesday 17th, and will offer 16 different Game of Thrones inspired tattoo designs… We had the chance to score ourselves a free one at the official launch party tonight but couldn’t bring ourselves to face the needle! 💉😖 Instead, we snacked on canapés and sat on the Night King’s lap. 😂😂 Thanks for having us guys! Start Fringe with a bang at NOLA’s Fat Tuesday!